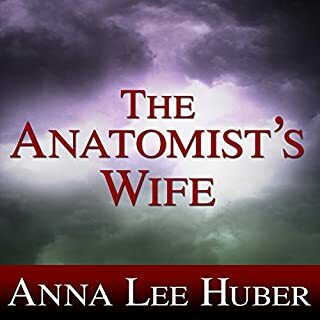 In this second book in the Victorian San Francisco Mystery series, it is the fall of 1879 and Annie Fuller, a young San Francisco widow, has a problem. Despite her growing financial success as the clairvoyant Madam Sibyl, Annie doesn't believe in the astrology and palmistry her clients think are the basis for her advice. Kathleen Hennessey, Annie Fuller's young Irish maid, has a plan. 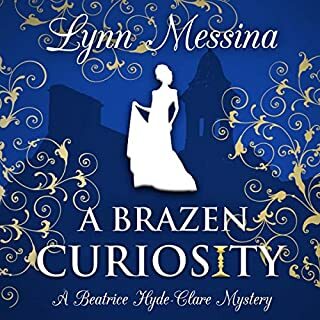 When her mistress is asked to expose a fraudulent trance medium, Arabella Frampton, Kathleen is determined to assist in the investigation, just like the Pinkerton detectives she has read about in the dime novels. Nate Dawson, up-and-coming San Francisco lawyer, has a dilemma. He wants to marry the unconventional Annie Fuller, but he doesn't feel he can reveal his true feelings until he has a way to make enough money to support her. 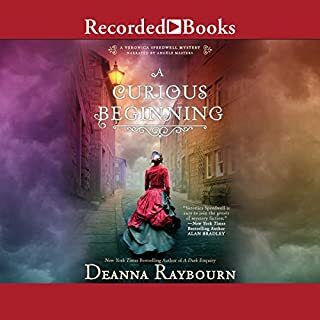 In Uneasy Spirits, this cozy historical mystery of romantic suspense, Annie delves into the intriguing world of 19th century spiritualism, encountering true believers and naïve dupes, clever frauds and unexplained supernatural phenomena. She will soon find there are as many secrets as there are spirits swirling around the Frampton séance table. 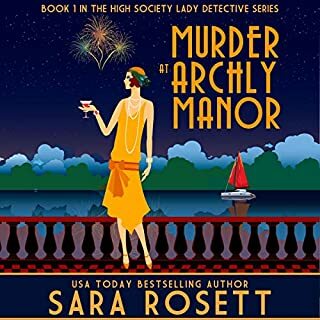 Some of those secrets will threaten the foundation of her career as Madam Sibyl and the future of her relationship with Nate Dawson, and, in time, they will threaten her very life itself. 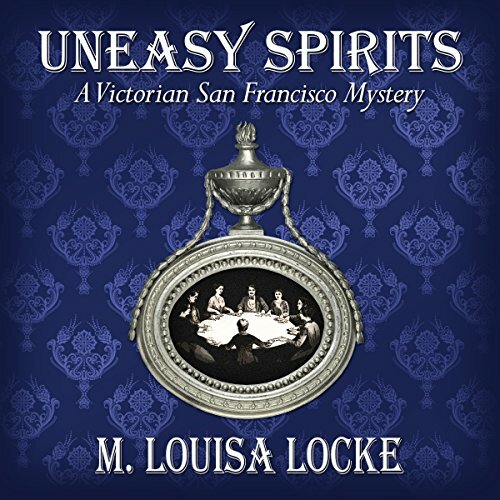 Uneasy Spirits is the second book in M. Louisa Locke's Victorian historical mystery series, followed by Bloody Lessons. I love this series! I enjoy the characters and the mystery, but what sets it apart is the setting of historic San Francisco. SF has been one of my favorite places to visit, and I enjoy learning about what it was like in the late 1800’s. Although there is a lot of historical detail, it always seems appropriate to and integrated into the story. 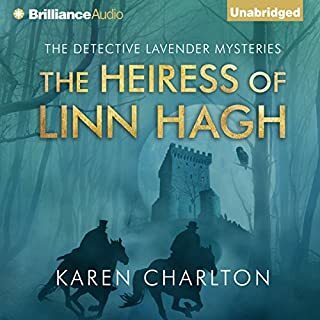 The narrator has a pleasing voice and I find her relaxing to listen to -- a good listen for commuting or before bed. Although this installment in the series has some mildly creepy aspects. There were a few times I decided it would be better listened to in the light of day! The story was elementary. It is easy to pick out the bad guy. I think I would listen another book. I found the reader hard to follow when she changed her voice for the different characters. She would start reading in character and her voice would change to normal before the end of character's quote. I gave the reader 3 stars for effort. Would you try another book from M. Louisa Locke and/or Alexandra Haag? I will not buy another audiobook with the same narrator. Her phrasing is poor; it's like listening to the "speak out loud" feature on my iPhone. The premise behind these stories is intriguing. I have tried 2 of them but will return this one because I forgot the narration grated on my ear. Worth trying one in print. definitely recommend. well developed characters and story line. What other book might you compare Uneasy Spirits to and why? What does Alexandra Haag bring to the story that you wouldn’t experience if you just read the book? Her inflections and character voices were well done and her diction very clear. When Annie Fuller was alone with the young girl it was unnerving. What I admire is how the author involves the reader in the mystery through relatable characters and rich historical detail. Well done, Ms. Locke. Annie is a compelling character, a heroine with just enough flaws to make her intriguing. This story centers around spiritualism of the day and Annie's efforts to expose a fraud, while examining her conscience about her own avocation. In the process she stumbles across a greater peril in progress and almost loses her life several times in pursuit. She meets a young girl who may indeed have the gift, but at such a cost. The narration is all well done with the exception of Nate, who is simply grating. The narrator simply isn't able to capture a male sounding voice for him and it somewhat disrupts the flow of the story to my ears. However, this is still a five star read and listen. I can't wait to crack open the next story and see what trouble Annie has gotten into now. Well done! Another highly ejoyable read from M Louisa Locke. Lots of character development and historical detail but neither ever bog down the story. The mystery kept me guessing right up to the final clue. 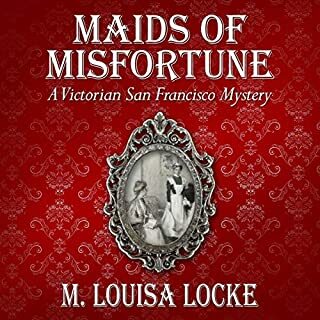 Author M. Louisa Locke produced a real page-turner, another of her 1879 San Francisco novels. This book read like a movie...and who knows with all the visual appeal Ms. Locke said included on each page it may become just that. The narration was 5 Star, too. A joy to read!!! Enjoyed this slice of San Francisco life. Usually read mysteries/thrillers set in present day . Have thoroughly enjoyed this story as well as the previous book " Maids of Misfortune." Would you consider the audio edition of Uneasy Spirits to be better than the print version? Somehow I managed to accidentally rate this book before I even read/ listened to it. As the rating could not be erased, I had to complete it in order to rate this book accurately. As the author had been a self published writer, I felt strongly that I should be fair to her. The book was good though it started a bit slowly. It wasn't very hard to discover the villain, but there were many other unexpected twists that made this a satisfactory listen. All is not as it appears! Anne and Nate have to figure out what is truth and what is fiction in this wonderful little tale. I am well pleased with these little mysteries. These are definitely fitting my mood right now with just enough danger but not enough to make one gasp. Well worth the credit! If you could sum up Uneasy Spirits in three words, what would they be? What was one of the most memorable moments of Uneasy Spirits? Too many to mention, the narration was dramatic and held my attention throughout this novel that had me on the edge of my seat. Annie is such a strong character she has such determination. Have you listened to any of Alexandra Haag’s other performances? How does this one compare? Yes she has great flair and her voice is clear and is easy to listen to. She added so much to this novel in her narration. Victorian mystery at its best. The wealth of historical detail makes this novel one I will enjoy listening to many times.